When looking at the types of machining equipment that Axis Fabrication has in-house, the acronym “CNC” comes up frequently. CNC stands for “Computer Numerical Control”, and is an alternative to manual production equipment. CNC involves pre-programmed software that controls factory tools and machinery. 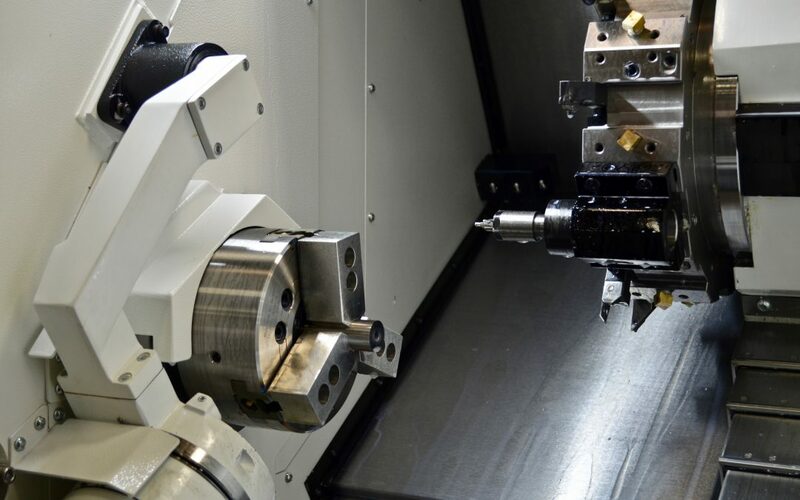 It is necessary for live operators to prompt and guide the commands of machining tools; however, they aren’t involved with the direct machining of pieces like the use manual machines requires. Finally, CNC machines may look like normal computers, but the programs and consoles involved make them unique. To begin, in CNC machining, CAD/CAM software develops a program that dictates corresponding tools and machinery, which carry out the dimensional tasks. The part program determines the placement and selection of tools by a series of numerical inputs. Notably, part programs control the speed, feed rate, and coordination of the machine in repetitive, predictable cycles with little human operator involvement. Programmers write and edit a code known as the part program. Also, programmers often use G-code, although there are proprietary codes in use. Furthermore, 2D or 3D computer-aided design, CAD, helps create part designs. CAM converts the design into code for the part program. Consequently, CNC machining is fully automated. CAD software designates part dimensions and CAM (computer-aided manufacturing) converts the material into the final product. A given workpiece could require many machining tools, such as milling or cutting. The ability to perform several functions in one cell increases productivity by accomplishing many tasks quickly in succession. Luckily, one part program controls all functions. Above all, CNC allows production of parts that would be difficult or impossible to replicate manually. Certainly, there are many advantages to CNC machining, and only a few disadvantages. As stated previously, CNC allows production of parts impossible to replicate manually. It allows for precise manufacturing with excellent repeatability with a wide range of materials. The downside to CNC unfortunately lies in the programming itself. CNC machines don’t possess brains of their own and therefore don’t have any sense of distances. As a result, computers will follow instructions exactly because they are intelligent but not intuitive. For that reason, this can lead to internal collisions and crashes that can either break tools or the entire machine, which can be a very costly mistake. There many types of CNC machines on the market. Here is a list showing most types of CNC machines used at Axis Fabrication & Machine. Further reading: Why is one part so expensive?